This project also aims at raising the profile and visibility of Klaipėda’s creative standing, locally, regionally and internationally. We have started development of the Seaside Resort “Queen Louise”. This historically important landmark to the city of Klaipėda is envisioned to be renovated and expanded to create a multipurpose complex including wellness resort and recreational residences. 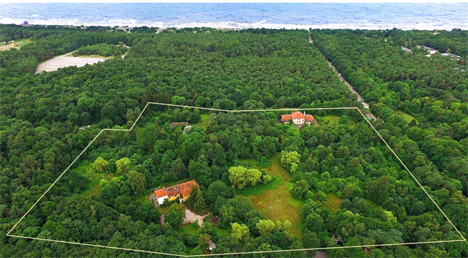 This scenic location, we believe, is ideal for providing access to the pristine Baltic sea coast of Giruliai not only through development but also through preservation. An undiscovered gem reﬂecting Northern Europe's pristine natural beauty. Dazzled by the brightness of our cities, we often forget the extraordinary vision that Systema Naturae can oﬀer us. However, there are still places that are close to nature where the beauty of nature appears in its entire splendour. Surrounded by sandy forests and dunes, this is one of the places where this magic continues to occur and where history keeps telling its eternal and beautiful story. It is a place that it is both incredibly beautiful and that needs to be preserved for future generations' enjoyment. The investors have a vision that the renovation of this territory will allow this preservation to be done in a commercially viable fashion but that also is aesthetically pleasing.